Its a great product, used it for awhile now and can set up time frames, stop orders, limited stop orders, close profit and many more combinations. Just finding the right combination and level you are comfortable with just takes time, so best to use demo account to test first before going live. True universal EA. You can build your own strategy and choose up to 18 different indicator filters working in multi frame mode simultaneously. Martingale averaging and trail functions. The strategy combinations is endless. Good money management and time trade options; closing deal function at trigger profit or loss; closing at time etc. Loss and drawdown protections are very useful for save your account balance. Very good support. I have investigated dozens of Universal EA's in the market, and I came to the conclusion that this is by far the most superior product available, and excellent value for its price. It is not a simple product and you need to spend time to understand its details (otherwise you might end up complaining that you can't control the product, as the previous reviewer seems to have done), but it provides a far advanced functionality compared to other Universal EAs. I rented the MT4 version for a month and bought the MT5 version as well (as I have both type of accounts), they both work very well and they are very reliable. Vladislav offers a very responsive service and excellent customer support. Yes there might be some language issues as he is not a native English speaker, but if you ask him the right question, you will always get the right answer and very quickly. He has updated the product a number of times, to fulfil requirements and requests from his clients (obviously there is a limit to that and you can't get free programmer services from a product designer). So in summary, 6 stars for the product and the customer support. 1. the program has no systematic user manual/guide, the settings have no clear meaningful name and there is nowhere to find what means the settings. For this reason, one may get lost due to the banch of settings. Furthermore, some settings are conflict with eachother. 2. there are bugs in the program, its behaviors can not be fully controlled by it's setting parameters, or, there are hidden settings which are not visible to the users and can override the visible settings. 3. beside the issues above, the support from the author is poor. The author doesn't answer the questions correctly, or can not understand the question. it's possible that the author is also get lost with the confusing settings. Complete product with excellent support. 5 stars with no doubts. For me the best EA in the market and more complete, good technical assistance solving doubts and errors. This product offers a multitude of excellent features, far too many to list here. One thing that is important to many people buying this product is the level of support..... and I have found support to be fast and excellent. It is easy to produce excellent strategies quickly using this tool. Top! O EA funciona perfeitamente.. basta cada um saber montar seu set. adequadamente! /// Top! EA works perfectly .. just let everyone know how to set up your set. Properly! I can recommend this top EA. The EA works very well and is high profitable. You can change a lot of settings and you can optimize the EA for every market that you like to trade. Of course you have to backtest and to try the new setting before you will use the EA on a live Account. And in this case you have also to choose the right Lotsize in depend of your Account. and the price which i paid ( 100 USD ) i got back already. For me it`s a very good EA and the rest is up to you! Also the price is really unbelievable and amazing. Your EA doesnt use SL and I lost half of my money. In EUR USD, the EA keeps on buying positions from 1.18xx level and the lowest is 1.09xxx. It should have cut loss much earlier but it didnt. Up to now the 1.18 has not been reached. I could have lost more but I seeked help and exited when the market surged to 1.08xxx. А так это идеальное решение для тех, кто постоянно генерирует и тестирует свои стратегии. С помощью данного советника не нужно долго тестировать в ручном режиме свои стратегии или периодически оплачивать программистов на написание бесполезных советников, с тем условием, что он позволяет не просто искать стратегии и обкатывать их, но ещё и работать по ним! Мне понравился. Тестил по разному. Очень гибкие настройки. Он один заменяет несколько сов. Алгоритм работы супер. Автору огромная благодарность. When you turn off signals and filters, the Expert Advisor only accompanies the open positions and does not open new positions. The breakeven level (LevelWLoss) can be calculated manually, taking the commission into account. If ControlNewBarforSIGNAL=true, the optimization speed is increased 1.5 times. - Added the ClosePosition_After_X_Minutes parameter: close position after a specified amount of minutes. 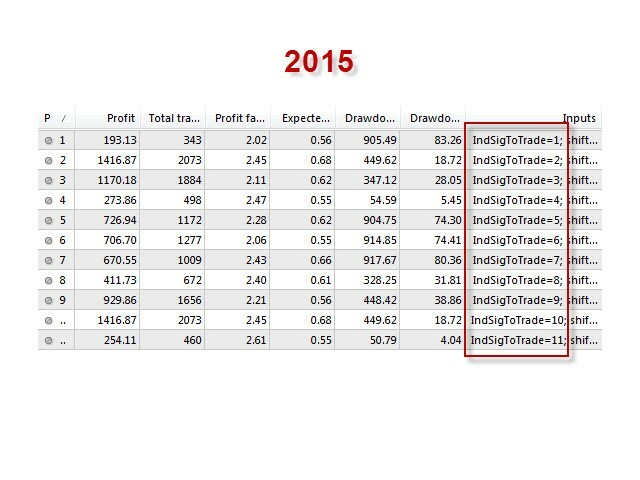 The EA also checks the enabled CloseChangeOnlyInProfit parameter: close only profitable positions. - Added the OnTester_Custom_max variable to the Tester block allowing you to write your own genetic optimization criterion. The entry is made as an equation. For example: OnTester_Custom_max="STAT_PROFIT*STAT_TRADES/STAT_EQUITY_DD"
The variable names should match the ones in the documentation! Note: It works only in Visualization mode or real chart only when the terminal is enabled. It does not work in optimization mode! Added the new parameter ReInstallStopOrdersNewSignalAppears - re-set pending orders if a new indicator signal arrives. This allows removing the current BUYSTOP pending order and place a new BUYSTOP on a new level after indicators have informed of a new signal. Added No Signal to the main signal. If selected, the EA ignores the main signal and trades by filters. This means the open signal is regarded a signal completion. If a signal arrives, while the filter does not allow opening a position, the signal is ignored. ATR_MULTIPLIER=1 - ATR ratio, for example EURUSD ATR=0.0020, when using ATR_MULTIPLIER=2. ATR=0.0040 is included into the calculation. If StopOrderBarToExpiration=10, and TF = М1, the pending order will be canceled 10 minutes after it is placed. Note for МТ4: in optimization mode, the virtual stop loss/take profit does not work. 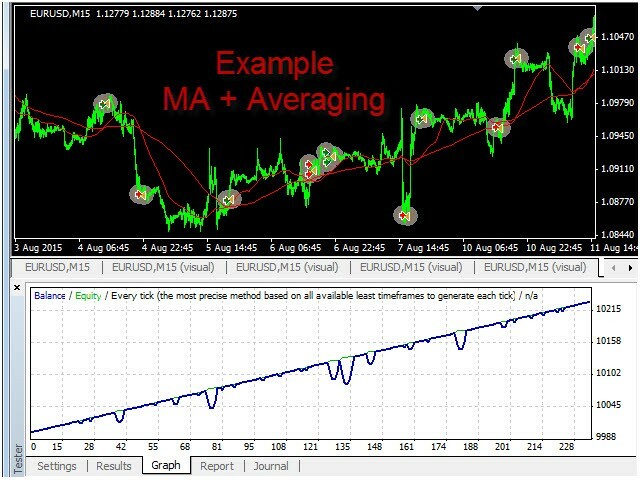 Fixed averaging when using the same magic number on several currency pairs simultaneously. 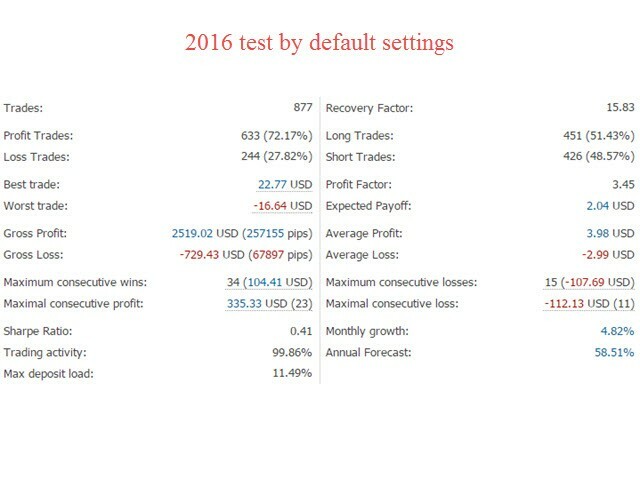 - Added the drawdown management block - DrawDown options. This block prevents the EA from opening new deals by new signals from the algorithm, or closes all deals on the account and stops trading after a certain drawdown. DrawDown_Level=true, DrawDown_Level_One=50,Type_Deal_Level_One=No_NewDeal, DrawDown_Level_Two=90, Type_Deal_Level_Two=Close_All. With these settings, once the current drawdown of deals in history and current deals exceeds the level of 50% of the current deposit, the EA is not allowed to open new deals by new signals. At the same time, the averaging functions will work. Once the drawdown exceeds 90%, the EA immediately closes all deals. Optimization of the EA operation. All! functions of the EA will be executed 1!! time at the opening of the bar (depending on the TF), including Modification, Trailing stop, Averaging, openng signals, etc. 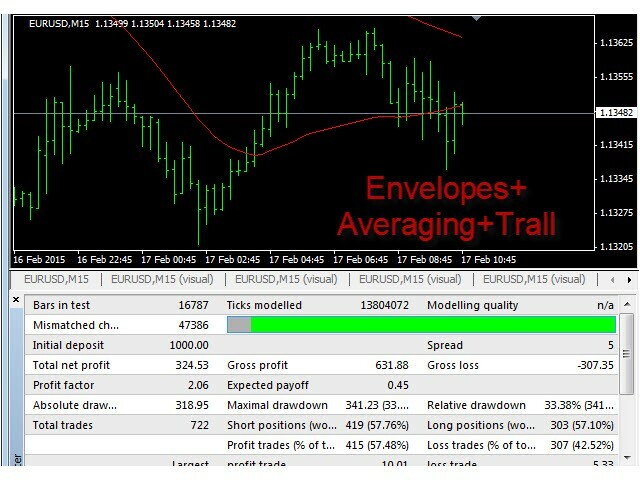 Added the CloseChangeOnlyInProfit parameter - close trades at an opposite signal only when the current position is in profit. Added the MinuteToOpenNextPosition parameter - number of minutes for opening the next trade by the indicators' signals. The parameter counts the number of minutes passed from the last open position. Trades can be sorted if ONlyOnePosbySignal=false. Added the OpenOppositePositionAfterStoploss parameter - open an opposite position when closing the current one by stop loss. An opposite position can be opened immediately after the previous position's stop loss activation without using the indicator signals. 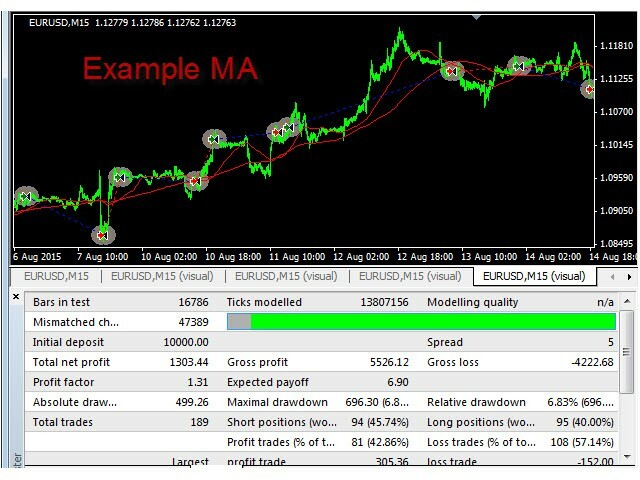 Added the MAX_BUY_POSITION MAX_SELL_POSITION parameter - limit the maximum number of trades. Fixed printing error messages to the log each tick in case of incorrect stops. In case of ManualSet, user receives a message that the stop levels in the EA are less than the minimum allowed ones, and the EA stops operation. 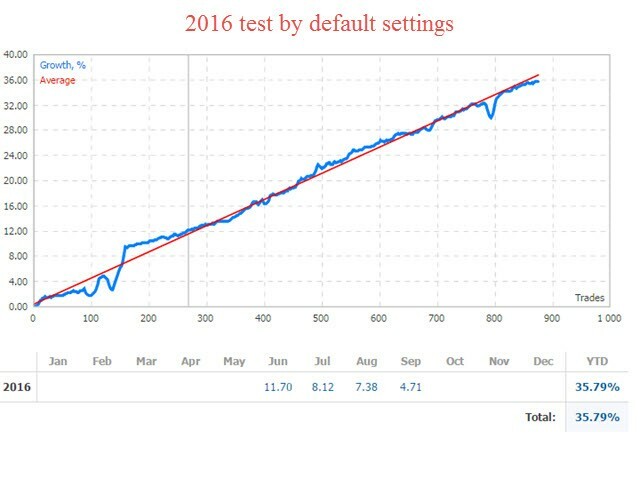 Added stop loss when using the Averaging block and Scaling by trend. Before: When placing an averaging trade, the stop loss of the trades was reset to 0. Fixed the error of virtual stops for averaging. At that: If trading is performed using pending orders and only in 1 direction: every time at new signal the old pending order will be deleted and moved to a new price. The EA checks of there are open positions with this magic on other currency pairs. If there is no such position, the EA opens a trade by signal, and the other experts will be waiting for this trade to be complete. 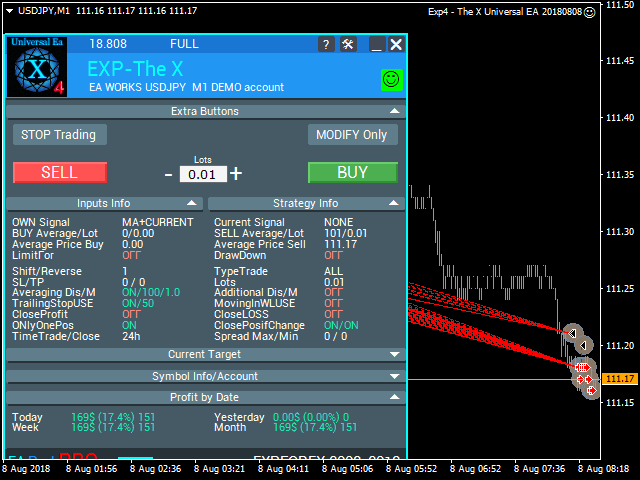 Now: If the IndSigToTrade signal appears, the FILTER_IndSigToTrade2 and FILTER_IndSigToTrade3 indicators are checked. If their signals go on, the trade is opened. Added the trailing stop by Parabolic to the averaging module. PROFITLOSS_EXTRASETS4 - limiting profit and loss in the deposit currency. If you want to limit losses for the current EA, use this new block. Once the loss for this magic and symbol reaches -100 USD for one day, new trades will not be opened on this EA. All other functions will keep working. The next day this parameter is reset to 0.